The Asian Festival returned with a bang this year, featuring more acts than ever. With dances to Korean pop music to a Southeast Asian fashion show, the auditorium was alive with talent. Like last year, Midwood’s Asian Festival took place on March 14 in the auditorium after school. However, this year was different because the audience was met at the door by members of the art team handing out pamphlets and glowsticks. The show also had more participants and two commissioners instead of one. The show followed its tradition of including dances from the latest Korean and Chinese pop songs, but also made sure to include more Southeast Asian culture. “Last year, we [Southeast Asians] felt underrepresented because it was just a fashion show,” said Taskin Khan ’20, president of the Bollywood dance club and manager of the fashion show. Aside from the main acts, there was a lot more going on behind the scenes. In particular, the small backstage crew was running around trying to ensure the show ran as smoothly as possible. 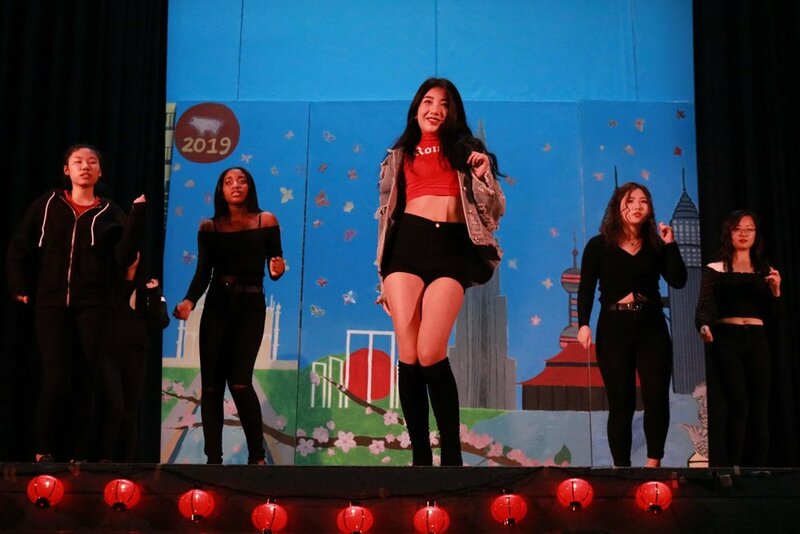 This show would not have been possible if it wasn’t for Joyce Chen ’18, Midwood’s Vice President last year, and Alina Ng ’19, who was the K-pop club’s president last year. It all began when Ng thought to revive the concept of Midwood’s Asian Festival and pitched the idea to Chen. Then, with the help of last year’s comptroller, Lillian Chen ’18, and supervisor Mr. Emilio Ortega, the show was on the road! The Asian Festival originally began in 1981, but saw its last show in 1999 until its resurrection in 2018. At first, it wasn’t a huge production in the auditorium. Rather, it was a gathering of foods from various Asian cultures in the cafeteria. The festival concept was reinvented by Ng and Joyce Chen to fit the modern tastes of students, and food was replaced by music and dance. This year’s show began preparation in December, which meant more practice time and more acts. The extra time was made possible by commissioners Helen Wong ’20 and Jessica Wu ’19, along with Mr. Ortega and Mr. Lawrence Yu, who supervised after 4:30pm. Mr. Ortega also mentioned how Asian Fest hopes to expand its horizons to Russian dances because people often forget that Russia is also a part of Asia. Thanks to the show’s increasing popularity, this dream may soon become a reality. However, this year’s participants quickly learned that with more people comes more challenges. “It’s really stressful, and we don’t get enough time for the stage,” said Christina Wu ’19, a dancer and choreographer in K-pop club. With so many people participating, it was difficult finding enough time for the fashion show, Bollywood dancers, C-pop dancers, vocalists, and K-pop dancers to all use the stage and prepare themselves for the show. However difficult the preparations may have been, the show was supported by many people, including last year’s commissioner. “I know from personal experience how stressful it can be to get a whole production together, so I offered to help the commissioners as much as I could,” Chen said. In the end, practice paid off and the audience decided the fate of the show with their cheers. Crossfire: Is Modern Tech Ruining Childhood?